The name of this stunning ornamental comes from the way morning light catches the dew, creating hundreds of sparkling gems on the stems. It has a graceful upright habit in full sun, but it even performs well in full shade, growing up to 4 ft. high. Blooms from midsummer on, making a wonderful focal point for the fall season. Potted plants. Zones 4-10. Light Required: Full sun to shade. Will bloom in full shade, but is more stately in full sun. Comments: Commonly called Diamond Grass for the way the morning light catches the dew and looks as if hundreds of diamonds are sparkling on the flower stems. 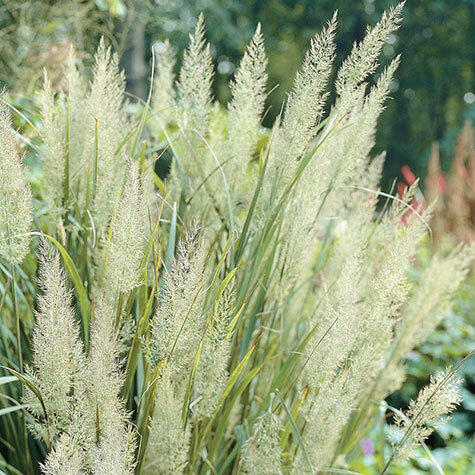 Stately ornamental grass that will perform in full shade with a somewhat relaxed habit and will serve as a wonderful main focal point for the Fall season. Diamond Grass is somewhat more upright when it is grown in full sun.